Cochrane Dollars bring people together in our community and support the local economy. Paper bills are available in the following values: C$1, C$2, C$5, C$10 and C$20. The Cochrane Dollars you spend stay with local businesses and stimulate the local economy, instead of leaving Cochrane and getting spent elsewhere. One Cochrane Dollar = one Canadian dollar. 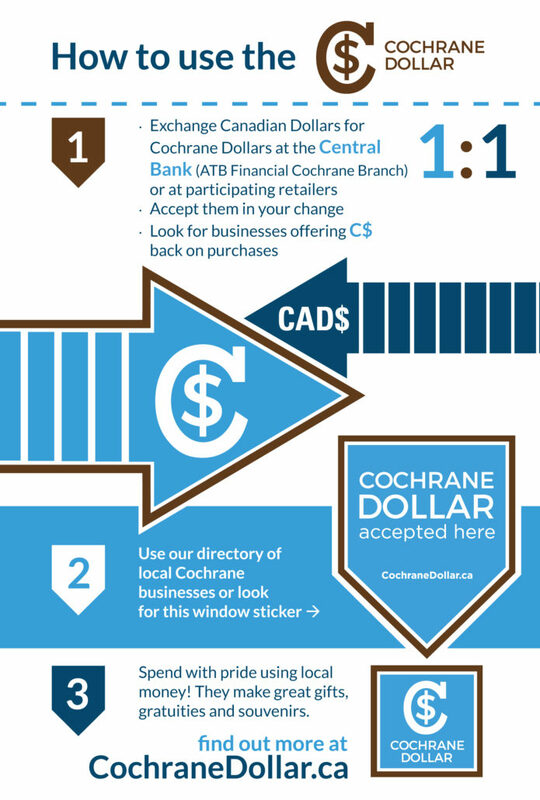 That means each Cochrane Dollar in circulation has CAN$1 in the bank (at ATB Financial) to secure it. Want to shop with Cochrane Dollars? Just accept and use Cochrane Dollars to keep them in circulation. There are many ways to use them! Want to accept Cochrane Dollars at your business? Any local business can participate. There are no start-up costs, and you are supported every step of the way with a fantastic marketing program. Dollars can be traded anytime at ATB Financial. Read more for businesses here. The next time your relatives or friends from other areas come to visit, be sure to give them a few Cochrane Dollars so they’ll also discover some of our local businesses. When you travel, think about giving Cochrane Dollars as a unique gift. Each bill illustrates part of the story of Cochrane and helps explain why we’re all so proud to live here. They cost nothing to use and are a fun and easy way to work together to keep our local economy prosperous.